Ethiopia Warns Saudi Arabia and UAE of Consequences if Eritrea Attacks: "Ethiopia’s Prime Minister Hailemariam Desalegn has warned Saudi Arabia and the United Arab Emirates (UAE) that there will be consequences if their military operation around Eritrea’s coast leads to the latter advancing plans to destabilize Ethiopia. A United Nations (UN) report published last month revealed that Saudi Arabia and UAE are paying Eritrea to use the country’s land, airspace and territorial waters. The Arab coalition has reportedly leased Eritrea’s Port of Assab for 30 years – from where they will lead the fight against the Houthis in Yemen. Hailemariam also stressed that the neither the UAE nor Saudi Arabia consulted Ethiopia before reaching the agreement with Eritrea. As a result, there will be reprisals if their military and logistical operations enrich Eritrea to attack Ethiopia. 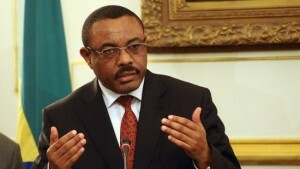 “We have also stressed that they will bear the consequences of our response if their operation in the area supports the Eritrean regime’s destabilization agenda against Ethiopia,” Hailemariam said. Hailemariam dismissed reports that Saudi Arabia and the UAE leased the Port of Assab from Eritrea for 30 years. According to him, there is no evidence that such a deal was reached. Tensions still abound between neighbors Ethiopia and Eritrea who fought a war from May 1998 to June 2000. Saudi Arabia and the UAE reached the agreement with Eritrea earlier this year after Djibouti turned down a similar proposition. However, Eritrea which has been described as Africa’s North Korea due to its closed borders, accepted the deal. Reports indicate that as part of the deal, the Arab coalition would give Eritrea fuel and financial compensations, which would go a long way to fund the heavily sanctioned government. The Arab coalition has reportedly also signed a similar deal with Sudan. Both Eritrea and Sudan have reportedly provided 400 and 300 soldiers respectively for the coalition’s campaign in Yemen. The coalition is trying to reinstate President Abdurabuh Mansur Hadi, who was forced to flee to Saudi Arabia last year after Houthi rebels took over the country’s capital Sana’a." Recent media reports indicate that Saudi Arabia and the UAE have contracted Eritrea’s government for assistance in the War on Yemen, using the East African state as a transit and logistics base for their operations, as well as 400 of its troops for cannon fodder in Aden. Add to it the Qatari soldiers that have already been present on the ground for a few years to “mediate” the border dispute with Djibouti, and the most important members of the Gulf Cooperation Council (GCC) have unexpectedly converged in what many might think to be among one of the most unlikeliest of places. While it may have been difficult to foresee this happening, in hindsight it actually makes quite a lot of sense, and contrary to the conventional assessment that this is about Yemen, the argument can be made that it’s also just as much about Ethiopia as well. Unbeknownst to many, Qatar is the “ox driving the cart” in this case, and whether they like it or not, the rest of the GCC states will be reluctantly forced to follow its destabilizing lead if Doha decides to throw Ethiopia into chaos. The research expands on the briefing first laid out by South Front and should be seen as a continuation of their original work. It begins by setting the context for what’s been going on along the Horn of Africa lately and how the GCC’s military advances fit into the larger context of recent history. The piece then investigates the levers of influence for how Qatar could destabilize Ethiopia as well as its radical ideological motivations for doing so. Finally, the article concludes with a scenario study of how Qatar could engineer an Unconventional War to bring down Africa’s next up-and-coming power. The Horn of Africa is one of the most geostrategic regions in the world due to its location along the Bab-el-Mandeb strait that connects the Gulf of Aden with the Red Sea. In a broader context, one can say that it’s one of two maritime chokepoints (the other being the Suez Canals) that link Europe with South, Southeast, and East Asia, and until the Northern Sea Route becomes operable sometime in the next decade, all sea-bound trade between the EU and these corners of Eurasia must transit through its narrow passage. As could be expected, this makes control over the strait a heightened prize for any power or combination thereof, and it’s not for naught that most Great Powers scrambled their navies to the region over the past decade ostensibly to “combat piracy”. What was really happening was that the US was trying to militarize the waterway under the auspices of countering “Somali pirates”, which it must be reminded, were bogeymen that were blown completely out of proportion by the Western mainstream media for premeditated geopolitical ends. The US wanted to create the conditions where the rest of the world would accept the continuous presence of its fleet operating in these strategic international waters, but precisely because their legal status, it meant that any other fleet could do the same thing on identical grounds, which is exactly what happened. While the UK and French navies were obviously there to support their American ‘big brother’, Russia, China, India, and Iran also sailed their ships there too, but for the purpose of both watching the West and symbolically showing that they won’t allow NATO to completely control this space. While the “pirate” hype has largely died down and the multilateral naval positioning over the Bab-el-Mandeb has markedly subsided since its frenzied height in the late 00s, the importance of the strait obviously hasn’t changed, and the American-initiated competition over its control merely took on another form and amphibiously migrated landward. The US joined its French partners in Djibouti by moving into Camp Lemonnier in 2001 (Paris never left the country after independence), thus giving it an on-land presence from which to project naval power if it chose to do so. It also opened up “anti-terror” facilities in Yemen during this time as well, but just like with the Djibouti base, these could also achieve the dual purpose of influencing the strait. With both of these power nodes already occupied by the US prior to the “anti-piracy race”, it might seem strange why America started such a game in the first place, but more than likely, it did so as a manifestation of the “exceptional” hubris of the Bush Administration that was also continued during the early reign of his successor. Thus, while the non-NATO states may have felt they somehow lessened the US’ control over Bab-el-Mandeb by placing and then removing their navies from the Gul f of Aden, it was all just a carefully crafted illusion (one which hopefully resulted in the multipolar states acquiring some degree of useful information about the Western fleets). The US still retained its positions in Djibouti and Yemen, albeit without the ability to directly apply the same amount of force had its naval presence still been there in the same capacity, so nothing really changed in a simple strategic sense. That status of affairs would remain until the Yemeni Revolution finally succeeded in casting off the American- and Saudi-installed government in early 2015, which dramatically led to the US having to evacuate its military personnel from the country. For the first time since the end of the Cold War (when the Soviets had a naval base in Aden), the US didn’t’ fully control the Bab-el-Mandeb, and the strategic panic that this produced is partly why Saudi Arabia made the fateful and ill-planned decision to invade Yemen. The Saudis and their lackeys have succeeded in blockading the Yemeni coast and conquering Aden, thus returning most of the unipolar world’s control over their lost ‘real estate’ in this ultra-strategic region, but capitalizing on their unofficial casus belli to make sure that they can indefinitely retain control there, the GCC decided to ‘jump the pond’ to the Horn of Africa, hence its interactions with Eritrea and the contracting of Amara’s ‘services’. In a sense, Eritrea is envisioned as being the Gulf’s “back-up Yemen”, a friendly territory under its proxy influence from which punitive measures can be launched against the people of Yemen if they ever do succeed in once more nearly liberating the entirety of their country. So long as Eritrea is under the GCC’s sway, then from a strategic-logistical standpoint, the Yemeni War of Independence will be all the much harder to win because the Saudis’ and their bloc have a ‘rear guard’ base almost directly abutting the country. The GCC’s actions in Eritrea can thus be seen as a type of “double insurance” in making sure that as many of the Yemenis remain under the Gulf boot for as long as possible, with such an unnecessary strategic consideration being seen as coming from a position of fear and weakness on their part, not strength. They fear the Yemeni militias so much that they’re preemptively creating this ‘rear guard’ supply and logistics facility in Eritrea “just in case” a counter-offensive one day manages to unsuspectingly cripple their occupying forces. It’s appropriate at this juncture to take stock of all the international military forces currently present along the Horn of Africa. The Saudis and Emiratis now have a naval presence in Eritrea, and as South Front reported (and which was verified separately this summer), the UAE is also seeking to open a naval base in Berbera along the northern coast of Somalia in the breakaway Somaliland region. The US and France have an on-ground presence in Djibouti, but they’re also joined by the Japanese, which opened their first military base abroad since World War II in 2011 under the opportunistic ‘justification’ of “anti-piracy”. They might, however, soon be joined by China, if the rumors of Beijing eyeing the country for its first overseas base are true. China could of course call upon the convenient slogan of “anti-piracy” to justify any possible forthcoming presence, but no matter what its stated grounds for doing so are, such a base would serve the additional purpose of safeguarding the Chinese-financed Djibouti-Addis Ababa railroad to the fastest-growing economy in the world and the headquarter state of the African Union. Now’s a good time to elaborate more in-depth about the continental African interests that the Gulf States seek to pursue through their partnership with Eritrea. To be more specific, it’s better to look closely at Qatar’s geopolitical objectives in this case, since the tiny emirate ironically leads the regional pack in its preexisting involvement in East Africa. This coastal state is one of the world’s newest, having gained its independence from Ethiopia in 1993 after fighting a three-decade-long war to achieve it. Peace came only after the government in Addis Ababa, at that time run by a military entity known as “The Derg”, was dissolved in 1987 and its leader Mengistu Haile Mariam was ousted in 1991 by a coalition of ethno-centric rebel groups. Due to the near-continuous fighting that took place on its territory, post-independence Eritrea was a wreck, but President Isais Afwerki helped to achieve stability and elevated living conditions, as attested to by journalist Andre Vltchek who visited a year ago. Nevertheless, the economy is in dire straits and Eritrea is largely isolated from the world community, partly due to the border disputes it has with all of its neighbors, and also because of successful Ethiopian lobbying against it. According to Ethiopia, Eritrea supports a variety of anti-government rebel groups and even has links to Al Shabaab in Somalia. The last point is extremely contentious and has never fully been proven, although to clarify a bit, a Wikileaked US diplomatic cable quoted the Somalian President accusing Qatar in 2009 of using Eritrea as a financial conduit for Al Shabaab. Considering Doha’s support to other terrorist groups such as ISIL, this doesn’t seem implausible, and it might even be that rerouted Qatari funds channeled through Eritrea (which might have received a modest cut) could be to blame for why Ethiopia would allege that its nemesis was aiding terrorists. No matter what shape it takes, Eritrea’s direct or indirect links to Al Shabaab are one of the reasons why the UNSC initiated an arms embargo on the country in 2009 that was just renewed last month. In this connection it’s relevant to remind one of Qatar’s role in the region, and it’s that it was asked to deploy “peacekeepers” along the Eritrean-Djibouti border by each of their governments in 2010 to assist in “mediating” their border dispute. One can cynically suggest that this provided nothing more than the perfect cover for Qatar to continue supporting Al Shabaab, which as was mentioned above, it had already been doing for some time. The reason Qatar supports this terrorist group is because it’s basically a regional franchise of ISIL, and a faction of Al Shabaab had just pledged allegiance to its Arab “brothers” late last month. These two groups pursue the same radical Islamic goals that Qatar has been patronizing for years through its sponsorship of the Muslim Brotherhood, and ISIL and Al Shabaab are pretty much the more visibly militant and globally notorious arm of the Brotherhood in this respect. To get a fuller grasp of why Qatar is promoting terrorism in East Africa, one should understand the macro-regional context of Doha’s ideological ambitions. The peninsular pipsqueak uses its financial largesse to flex power disproportionate to its tiny size, and it manifests this through support of a hodgepodge of ultra-extreme Islamic groups, all of which are classified as terrorists by Russia: the Muslim Brotherhood; the Taliban; ISIL in Syria, Iraq, Libya, and Sinai; and Boko Haram. Each of these terrorist groups is active in a certain geographic area, with the only ‘missing link’ being the southern vector, ergo the ideological/militant ‘necessity’ of Al Shabaab. Altogether, these terrorist organizations represent the ‘foot soldiers’ of a transnational caliphate project that Qatar and its US ally would like to see expand all throughout the central pivot of Afro-Eurasia, the “Greater Middle East” of Central Asia, the ‘conventional’ Mideast, North Africa, and East Africa. While its current prospects of success have dramatically dimmed ever since Russia’s anti-terrorist intervention in Syria, it still remains possible for Qatar and the US to actualize some aspects of this grand strategy in certain corners of their operational theater, which in this context is the Horn of Africa. The introduction of “managed chaos” to the region via the Qatari-supported Al Shabaab terrorist group serves two main purposes. The first one is to pressure Ethiopia, which the US may feel more inclined to do if the country moves more solidly in a pro-Chinese direction in the future, and the second is to perversely use the presence of Al Shabaab to deepen its security relationship with Ethiopia by being the arsonist-firefighter that creates a problem and then ‘helps resolve’ it afterwards. It’s useful to recall that the US contracted Ethiopia to invade Somalia in 2006 in order to destroy the Islamic Courts Union (ICU), a precursor of Al Shabaab, which thus strengthened the partnership between the two. Also, by keeping Islamic terrorism alive in Somalia, to whatever extent it’s present at a given moment, the US can keep the ‘justification’ open for selectively intervening in the country with drone strikes or commando raids, thus entrenching its presence in the region and turning the criminal into the ‘cop’. Rewinding the focus back to Eritrea, Asmara is passively tolerant of Qatar’s Al Shabaab patronage because it could supplement its grand strategic goal of destabilizing Ethiopia. To explain, Ethiopia has previously intervened in Somalia against Islamic terrorists before and subsequently occupied the country, and the idea that its forces could continue to do so again in the future, and thus be bunkered down in another potential quagmire and spread thin in critical (and rebellious-prone) interior regions, excites Eritrean strategists. Furthermore, as will be explained more fully in the third section, there’s the potential for Al Shabaab terrorists to become the “freedom fighter” figureheads for the Somali population in Ethiopia’s eastern provinces, formally the Somali Region but also known as Ogaden. Eritrea’s most important objective is to have ethno-centric regions inside of its former colonizer achieve independence in the same manner that it did – through prolonged and militant struggle against the central government – so that its rival can never be in a position to threaten it again (let alone exist in its current state). If the Somali region just so happens to be the spark needed to set the whole federal haystack alight, then so be it, as Asmara’s reckoning goes, whether its Qatari-supported terrorism that initiates the destructive domino effect that they expect or an indigenous ethno-centric uprising. To bring everything together in a more simple understanding, Qatar has taken the lead in destabilizing the Horn of Africa out of ideological and unipolar-loyalty reasons, and it’s using its “legal” presence in Eritrea to facilitate this. The War on Yemen provided the other main GCC states of Saudi Arabia and the UAE with a ‘plausible justification’ for also ‘getting in on the action’, knowing just as well as Qatar does that Eritrea is a ‘double-hinged’ state that can be used to simultaneously project maritime and continental influence, with the latter case being against Ethiopia. Concerning the GCC’s newest geopolitical target, it’s one of the world’s most promising emerging economies, and from a Gulf perspective, it could also be useful in satisfying their African-directed agricultural and construction-outsourcing needs. Placing their forces in Eritrea, Ethiopia’s arch-rival and hated foe, is designed to put pressure on the rising, albeit potentially unstable, continental power and thus make it more amenable to whatever their forthcoming grand interests may be. Also, by making Eritrea an integral part of their regional military architecture, the Gulf States are essentially declaring that any aggression against it would also endanger their own interests, thereby blanketing Asmara with a de-facto security guarantee and altering Addis Ababa’s perceived existing strategic balance of power (which it had earlier assumed was relatively even). By itself and approached from a purely geopolitical standpoint, it’s theoretically possible for Saudi Arabia and the UAE to maintain this new status quo between Eritrea and Ethiopia (perhaps even exploit it and each of those two states to their own advantage if shrewd diplomacy is applied), but the presence of Qatar, the ‘loose cannon’, means that the entire arrangement is inherently unstable and subject to sudden change. Qatar has proven itself much more prone to impromptu outbursts of rhetorical rage than any of the other Gulf States, and its comparatively younger leader (only 35 years old) is much less versed in the art of statecraft than his peers. Being so hot-headed and already harboring an inferiority complex vis-à-vis his larger and more mature neighbors, Qatari Emir Tamim bin Hamad Al Thani is inclined to give the full terrorist ‘go-ahead’ whenever he feels like it (or if he ‘thinks’ it would be of strategic use for him), meaning that a Qatari-sponsored Islamic destabilization of Ethiopia cannot at all be discounted, and must be astutely prepared for by the country’s authorities. The final section of the research discusses the Unconventional War scenario that Qatar could help engineer alongside Eritrea and Al Shabaab (one of its ideological ‘children’, it could be argued) to throw Ethiopia into chaos. Once this process begins, Saudi Arabia and the UAE could be expected to assist Qatar and this scenario to some extent, knowing that Doha is much too tiny and inexperienced to ever fully control the larger developments that it helps to unleash (the “Arab Spring” Color Revolutions are a case in point), and they thus want to be in a position to gain as much self-benefit from what may turn out to be an irreversible course of events. Correspondingly, with these self-motivated interests in mind, they could act as force multipliers in their own way for advancing the chaos that Qatar created, thereby ushering in a chain reaction that could lend crucial and ultra-destructive force to the scenario that will be discussed. The full consequences of Ethiopian chaos won’t be discussed in the scope of this article, but they can be assumed to have the risk of virally spreading through parts of the North and East African regions (since Ethiopia is of the latter but capable of influencing the former through its border with the rebellious Blue Nile state of Sudan), and would at the very least impact the country’s 95 million or so citizens to an undetermined extent (to say nothing of the transnational social implications). Also, with China’s economy becoming more dependent for growth on trade with Africa, any significant disruption in Ethiopia, Beijing’s prized partner nowadays, could directly ripple back to the East Asian giant and negatively affect it to a degree, all depending of course on the preexisting level of Chinese-Ethiopian trade. The higher that Ethiopia rises in terms of international significance (be it diplomatic, economic, military, etc. ), the harder its fall could be and the further the aftershocks would travel across the globe, thus suggesting that the (US-advised) Qatari destabilization of Ethiopia could be timed to achieve maximum effect depending on its relationship to various actors (in this case, likely China) at the given moment. The greatest and most imminent threat to Ethiopia lays in the sphere of ethno-separatism, the sentiment of which has continued to boil even after the Cold War-era civil war was brought to a close. Part of the reason for this is that Eritrea’s independence set a dangerous precedent for the militant representatives of the country’s disaffected ethnic groups, which it seems include just about every single one of them in some capacity or another (even the dominant Oromo and Amhara pluralities). The reason for this is that Ethiopia is a hyper-eclectic country with a wide array of identities within its federal structure, and in such a situation, it’s always difficult for any governing authority (let alone what some rebel groups allege is the present Tigrean-dominated one) to strike the perfect balance between each of them and leave everyone satisfied. This preexisting state of divisive affairs was utterly exacerbated by the Ethiopian Civil War that broke out against The Derg, where ethnic-affiliated rebel groups banded together in order to overthrow the central governing authority. The militant comradery that developed within each identity community as a result heightened the self-awareness that each of them felt about their differences and thus made a post-war federal structure the only realistic means of keeping the country together, especially after Eritrea’s successful secession in 1993. The CIA World Factbook lists the ethnic proportions as being “Oromo 34.4%, Amhara (Amara) 27%, Somali (Somalie) 6.2%, Tigray (Tigrinya) 6.1%”, followed by a multitude of others that compose minimal percentages. Altogether, these four groups form a little less than three-quarters of Ethiopia’s population, mostly concentrated in a north-south belt stretching between Tigray, Amhara, western Oromia, and northeast Southern Nations, Nationalities, and Peoples Region. The Afar and Somalis are a very small minority of the population and by themselves cannot account for the 33.9% of Muslim adherents in Ethiopia, and as the above map indicates, many believers in this religion live intertwined with Christians in Oromia, the most populous region. By itself and with the absence of context, this isn’t anything particularly relevant to Ethiopia’s stability, but recalling how Qatar and its Saudi ally have been front and center in provoking a clash of civilizations through their support of Islamic terrorism, this demographic factor becomes perhaps one of the most important of all. Al Shabaab in Somalia is pretty much one of Qatar’s proxy creations, just as ISIL is, and its proximity and ethnic overlap with the Somali Region is a definite cause for concern. Taken together, a Qatari-orchestrated jihadist-separatist war emanating from the Somali Region could prove to be the catalyst that sets off a whole conflagration of nationwide conflict. This initial Unconventional War has a very real risk of occurring due to the doubly second-class status that Somalis feel they are afforded due to both their ethnicity and Muslim faith. Al Shabaab’s terrorist war in neighboring Somalia actually began as an Islamic-tinted national liberation movement in response to Ethiopia’s 2006 occupation, but it rapidly descended into the jihadist nightmare that lay at the core of its proponents’ true vision. Although it showed its true colors and most undoubtedly scared away many possible supporters that would have otherwise flocked to it for its originally marketed national liberation agenda, it still commands some indigenous support inside Somalia, thus raising the risk that it could also do the same amongst the Somali community in Ethiopia that might still consider itself occupied (or be led to think in such terms). The concept here is that Qatar would use jihadism to radicalize separatist Somalis in getting them to become diehard supporters of the cause, holding out the carrot of a Greater Somalia if they’re successful. This irredentist dream would neatly overlap with Qatar’s own of creating a proxy caliphate in the Horn of Africa, but it also places limits on the primary geographic area of focus for its terrorist campaign. However, with the nature of terrorism inherently being that it knows no borders, it’s of course possible that attacks could take place in the densely populated and centrally positioned Oromia Region, which could have the effect of sharpening the Christian-Muslim divide in the area and prompting copy-cat and reprisal attacks. The destructive chain reaction that this might set off could only realistically be put to rest by a heavy-handed military response, albeit one which may scare investors right out of the country and lead to Western condemnation. In and of itself, whether or not the jihadist-separatist war succeeds in its stated goals, it would still accomplish what might have been the indirect (perhaps even actual) objective all along of weakening Ethiopia and possibly even China’s position in the continent depending on the degree of closeness and importance that Addis Ababa occupies for Beijing by that time (which is expected to be ever increasing). Regardless of whether or not Qatar ever goes forward with the previously described scenario, that won’t in any way prevent Eritrea from continuing with its own, as it bases its national security on keeping the Ethiopian military distracted and divided through its support of ‘stand-alone’ and unified rebel movements so that it can’t ever solidly converge against the country. Eritrea would like to one day liberate the city of Badme that Ethiopia has refused to cede to its control after the Algiers Agreement ended their bloody and stalemated 1998-2000 war and a Hague border commission ruled that it’s Eritrean territory, and it might be using its support of various rebel groups as a means of pressuring Addis Ababa into acceding to its international legal obligation. Asmara’s aspirations are to assist neighboring Tigray Region fighters in their quest for independence, mirroring Eritrea’s own, in order to create a buffer state that would insulate it from any future aggression from the rump Ethiopian state. At the same time, however, Eritrea also has ties with rebel groups operating deeper in the country, and if significant battlefield coordination can ever be maintained between Eritrea and the Oromo separatists (the ethnic group of which is the most populous and geographically central in the country), then it would go a very long way towards giving Asmara a lever with which it can trigger serious damage to Ethiopia’s national unity. Some Oromo might be attracted to the nationalist rhetoric coming from their militant-separatist counterparts that allege that the group is being exploited to support the minor peripheral ethnicities, and any visible “Tigrean-dominated government” crackdown on their civilian representatives might add credence to this belief. Eritrea might even ‘get lucky’ if the current tribal violence in South Sudan motivates a spillover effect into the neighboring Southern Nations, Nationalities, and People’s Region (home to 45 different ethnic groups) or Gambela Region that ‘naturally’ creates the state-fragmenting process that it and Qatar and looking to achieve for their own respective ends. On a final note, concerning any strategic Eritrean-Qatari collaboration in a future destabilization campaign against Ethiopia, the potential exists for Doha to stab its ‘ally’ in the back if its jihadist campaign is ‘too successful’. Eritrea might ironically be even more susceptible than Ethiopia is to an Islamic terrorist campaign because it has a similar proportion of Muslims that are also living in a similar economically challenging environment, and thus, might be ripe for ideological-religious manipulation under the ‘proper circumstances’. Additionally, the Muslim Afar living in the east partially represent Eritrea’s version of Ethiopia’s ethno-religious identity overlap that the latter has with the Somali Muslims, thus potentially leading to the same type of strategic vulnerabilities in this scenario. This factor could also be used by Qatar to manipulate Eritrea and keep its leadership in check, just in case the improbable happens and for whatever reason it decides to turn its back on its new patron. On the flip side of things, so long as Asmara remains a loyal client of the Emir (which doesn’t seem set to change since it desperately needs the money and diplomatic support), it shouldn’t have anything to worry about. Eritrea is also much smaller than Ethiopia in both demographic and geographic terms, so it’s a lot easier for the state to exercise supervisory control over what’s going on and nip the jihadist process right in the bud before it fully blooms. However, as chaotic processes always prove themselves to be time after time again, once the genie is let out of the bottle, it’s impossible to stuff it back in, and even if Qatar doesn’t plan for it to happen, the jihad it unleashes in Ethiopia could also infect Eritrea in no time. While it may not seem like it at first, the GCC’s military-logistical move into Eritrea is predicated just as much on influencing Ethiopia as it is about dominating Yemen. The Saudis and Emiratis may have just recently incorporated Eritrea into their coalition framework, but Qatar has been cultivating close ties with Asmara for the past 5 years as part of its “mediation” role in resolving the Djibouti border dispute, which incidentally saw it deploy 200 troops to the country. This means that the Muslim Brotherhood-espousing state is in a position to project its ideology throughout the region and intensify cooperation with its Al Shabaab proxy in nearby Somalia. The Saudis and Emiratis may initially be adverse to Qatar ‘rocking the boat’ in the region until after they’ve already tapped all of its economic benefit (which could take decades), but given Doha’s emotional- and ideological-driven foreign policy, it might do just that because it senses a ‘good opportunity’ here or there for furthering its self-interested geopolitical project. In such circumstances, the GCC wouldn’t be able to indefinitely hold out the threat of Islamic-inspired terrorist destabilization as a means of blackmailing the world’s fastest-growing economy and one of Africa’s up-and-coming powers, but would have to reluctantly join in the Qatari-initiated unrest so as to secure whatever benefits they can while there’s still the ‘opportunity’ to do so. The ethnic, social, and religious cleavages already prevalent (and even overlapping in some cases) in Ethiopia provide more than enough domestic ‘gunpowder’ for a strategically placed spark to set the whole powder keg aflame, with the only fail-safe solution being for Addis Ababa to overwhelmingly respond with military force. Such a reaction might predictably scare away the investors that are needed to keep the ‘Ethiopian miracle’ alive, and the combination of capital outflow plus military suppression (no matter how justified it may seem) might further exacerbate the domestic differences in the country and place them in a perpetual process of worsening, up to the point of the country approaching the geopolitical abyss of dissolution along preexisting ethnic-federative lines. Any disruption of Ethiopia’s stability could also be used as an indirect means of attacking Chinese interests in Africa, since Beijing has invested billions in helping the country rise and is expected to become increasingly dependent on its African economic partnerships in order to sustain its own growth at home. Large-scale unrest in Ethiopia could thus offset China’s plans for cooperating with the country on a high-level strategic basis, and it would thus lose not only a crucial marketplace for its goods or an attractive investment destination, but also its place in influencing the African Union right at its headquartered source in Addis Ababa. Therefore, many layers of intrigue blanket the possibility that Qatar may lead the GCC into a proxy confrontation with Ethiopia, be it out of its own regard or acting on behalf of American ‘advice’, which could see the Gulf using the country of Eritrea alongside Al Shabaab jihadists to dislodge China from its most important foothold in Africa.